Today, Thanksgiving is one of the most important holidays in the United States. 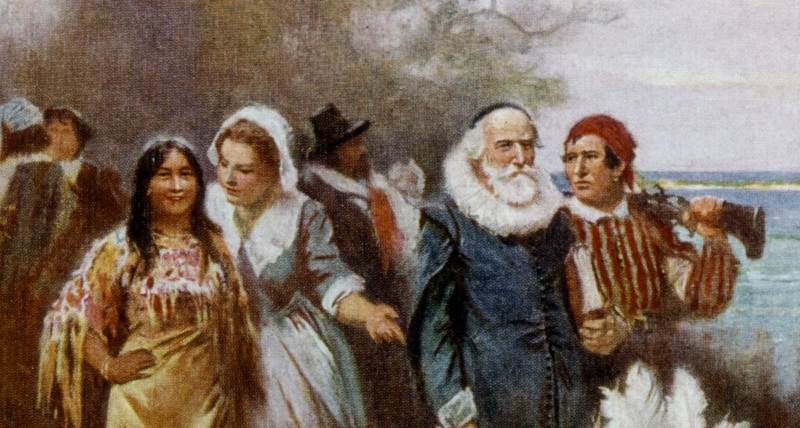 Originally, the intention of the celebration was to thank God for the harvest and the survival of the Massachusetts colony during their first year. Over time, Thanksgiving became the secular family holiday it is today, with parades, sports events, and a traditional Thanksgiving dinner. Thanksgiving was partly influenced by European harvest festivals and the religious practices of the Pilgrims which involved thanking God for positive events in their lives by days of prayer. 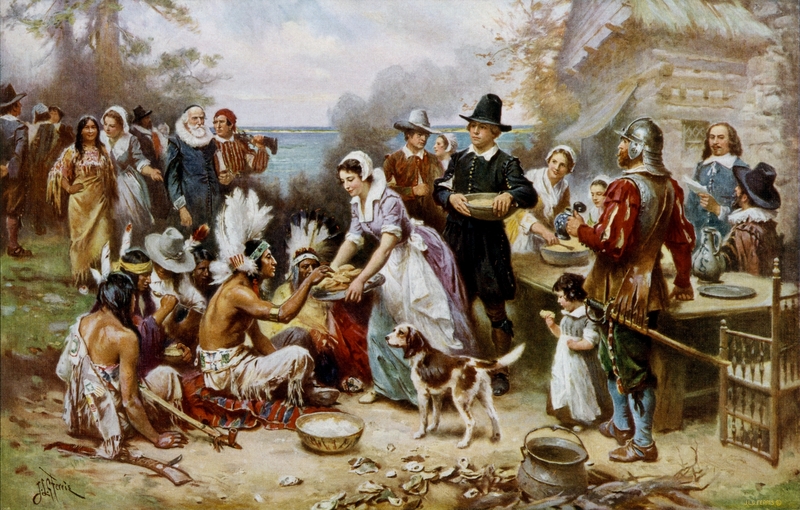 However, the Thanksgiving celebration of 1621 is often referred to as the beginning of the American holiday tradition – the “First Thanksgiving.” The settlers and a group of Wampanoag (Native Americans who had lived in the area before the arrival of the Europeans) supposedly celebrated and feasted for several days. The “First Thanksgiving” is part of American popular culture today. An important part of the image that Americans have of the “First Thanksgiving” is a painting by Jean Leon Gerome Ferris, created between 1913 and 1915. How did the artist picture the 1621 celebrations, and how did he convey his ideas of the event? 1 | a) Look at the painting “The First Thanksgiving 1621” by Jean Leon Gerome Ferris and briefly describe it. Focus on how the people are depicted, how the group is arranged, what they are doing and the general atmosphere of the painting. There are … in the picture. The painter mainly used … (e.g. light green / dark brown etc.) colours. b) Hover over the picture with your cursor to zoom in. Try to find additional details that you did not mention in a) (body postures, facial expressions, clothing, symbols, special items, the background, etc.). Note down at least four details and describe each of them in one or two sentences. The person is wearing / standing / sitting / holding…. This object is painted large / small / tall / round. c) The painting is meant to show the first Thanksgiving feast in Plymouth 1621, after the first settlers had brought in their first harvest. However, it was created between 1913 and 1915, almost 300 years after the event. The artist, Jean Leon Gerome Ferris, became famous for painting well-known scenes of American history. What kind of impression of the event does the picture convey? Which roles do the different persons fulfil in his arrangement? What aspects of Thanksgiving were important to the artist? What might have been his intention while creating the painting? I think the most important thing for the artist is …. 2 | a) In the 17th century, Thanksgiving was celebrated to thank God for the harvest and the preceding year. Until today, it is one of the most beloved holidays in the U.S. Why does it still hold such significance? b) Native Americans are part of the popular picture of the "First Thanksgiving," as the painting demonstrates. However, most Native Americans do not celebrate the holiday today, and some protest against it. Can you find possible reasons for that?